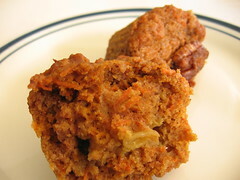 Healthy Carrot Muffins - Do You Know The Muffin Man? Notes: The healthy aspect of this muffin is in the use of whole wheat flour and wheat germ. I forgot I had regular whole wheat flour and ended up using some durum whole wheat flour. I also didn't have crushed pineapple on hand, substituting chopped fresh Rainier cherries. Fortunately, the moisture from the carrots and fruit was enough to keep the muffin from being too tough. They didn't rise too much, and weren't all that tasty.